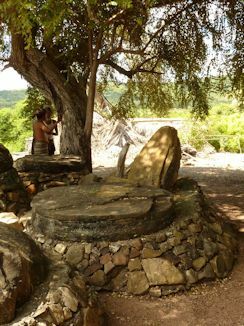 Megalith at Nada Woe, Pedèro, Mesara. The megaliths of Savu are considered natural wonders. What evades common understanding is transmitted in collective memory as the work of supernatural powers. In popular memory the large stones found on ritual places on Savu appeared overnight ‘by magic’ a long time ago. In fact the large and elliptic tones have been shaped by nature and offer a fascinating case for geologists. 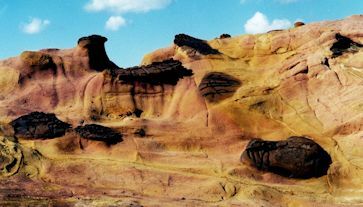 According to the geologist Ron Harris these sandstones are concretions resulting from cementation processes which formed 250 million years ago at a depth of two or more kilometers. Concretions and the work of erosion at Wadu Mea, ‘Red Rocks’. During the last 2 million years, the collision between the Australian and Asian continental plates uplifted the sandstones to the surface. The collision of both tectonic plates is an ongoing process responsible for a number of earthquakes felt in the area. (see R. Harris & al 2009). The megaliths on Savu are not burial places. The stones were dragged to ritual places and are used as physical as well as time markers. A stone can remind of a particular important ancestor, the founder of a clan or of a priesthood task, thus fulfilling the role of memorials. 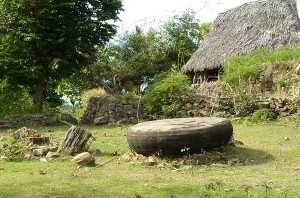 Namata, the main ritual arena of Seba, has possibly the largest gathering of stones of various sizes on the island. 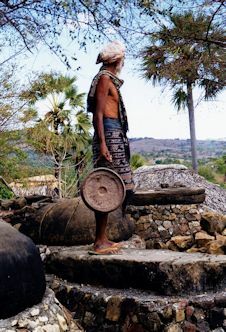 There, every priest of the ancestral religion Jingi tiu is in charge of at least one sacred stone; the meat of a sacrificial animal can be placed on the stone while praying; a priest may stand on ‘his’ stone while chanting ritual texts or sit on it when connected to his ancestors. Bawa iri, helper of the main priest Deo Rai standing on a megalith in Namata.